Online shopping is one of the dividends of the Internet technology. Online shops give shoppers the privilege of getting some benefits that cannot be offered in a physical store. Despite this, many potential customers have not embraced the technology, due to varying factors. The present article adapts the Theory of Reasoned Action and Technology Acceptance Model to investigate factors affecting the adoption of online shopping by Nigerian undergraduate students, using the University of Ibadan as a case study. Employing the quantitative research approach with survey method, it was discovered that a perceived ease of use and perceived usefulness significantly influence students' attitude to online shopping. Attitude, trust and subjective norm were found to influence behavioural intention to adopt online shopping, which in turn affects students' adoption of online shopping. People of different ages and status have engaged in commerce, the negotiated exchange of valuable objects or services between two or more parties. Traditional commerce involves the adoption of means which are often based on face to face interaction. This approach of commerce is however attributed with challenges such as customer anxiety, overcrowding of business places, traffic jam, time constraint and limited parking space. The advent of the World Wide Web (WWW) in the 1990s provided a solution to the problem faced by people in traditional commerce by providing a platform for electronic commerce, an easier way of doing business. E-commerce is a business transaction carried out through electronic data transmission and World Wide Web (Oluyinka, Shamsuddin, Wahab, Ajagbe, and Enegbuma, 2013). It comprises a wide range of commercial activities such as electronic fund transfers, on-line trading of financial instruments, electronic data exchanges and online shopping (Hellerstein, 2002). Online shopping is a single, homogenous activity which involves trading of goods and services through the www. It requires the existence of a retailer’s websites through which shopping is done in a virtual world, without a physical contact between sellers and buyers (Birkin, Clarke and Clarke, 2002). Online shopping enables consumers to visit online stores, locate and select products, make payment through credit and debit cards or cash on delivery and get their goods at their door steps (Aminu, 2013). Online shops give shoppers the privilege of getting some benefits that cannot be offered in a physical store; prices can be compared before purchases are made by visiting electronic stores of two or more competing electronic retailers that offer the same product for sale. Despite these and many other benefits of online shopping, many potential customers have not embraced the technology. Different factors have been reported to have contributed to adoption or non-adoption of electronic shopping by different groups of people. 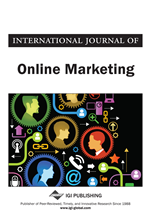 For example, consumers’ perceived enjoyment and control were reported to have significant relationship with online shopping adoption in the United States of America (Domina, Lee, and MacGillivray, 2012); perceived playfulness, perceived ease of use of online shopping (PEOU) and behavioural intentions affected adoption of online shopping in Turkey (Celik, 2011); establishing cost, accessibility, privacy and confidentiality, data security, network reliability affected online shopping adoption in Nigeria (Folorunso, Awe, Sharma and Jeff, 2006). While the differences in the factors reported by different studies might not have been unconnected with the varying goals of the different studies, the prevailing conditions in different environments in which people exist might also affect what factors will influence technology adoption by them. For example, Alley (2010) while comparing online shopping behaviours of Nigerian post graduate students studying in Sheffield and Nigeria, reported that trust and personal constraints were the factors that inhibited adoption of online shopping by the Nigerian respondents, while the same trust and another factor, consumers’ perceptions of technology, encouraged the Sheffield’s respondents to shop online. The implication of this is that knowledge of factors that affect people’s adoption of this technology under different contexts would be a useful undertaking, particularly towards improving its acceptance among potential users.